Like your favorite college sweatshirt, this Summer Farro Salad with Cubed Mozzarella, Tomato & Fresh Herbs is comfy, trusty, and familiar—as if you've known it for years. Embark on the recipe and you'll be swooning at first bite, a budding courtship that will blossom quickly into a dependable old pal. This recipe is a shoo-in for your regular summer salad rotation, so you're sure to remain well acquainted. Can a salad be described as easygoing? This one-pot farro bowl is a pleasurable cinch. It's effortless to make, store, transport, and keep. The ancillary ingredients are common enough to appeal to any crowd—who can't resist briny olives, juicy tomatoes, and fresh parsley/basil in a slug of tangy vinegar and slick olive oil?—yet just different enough to incite intrigued pause. I know, you were expecting feta after hearing olives and tomatoes, but how refreshing are those soft, tender cubes of mozzarella instead? 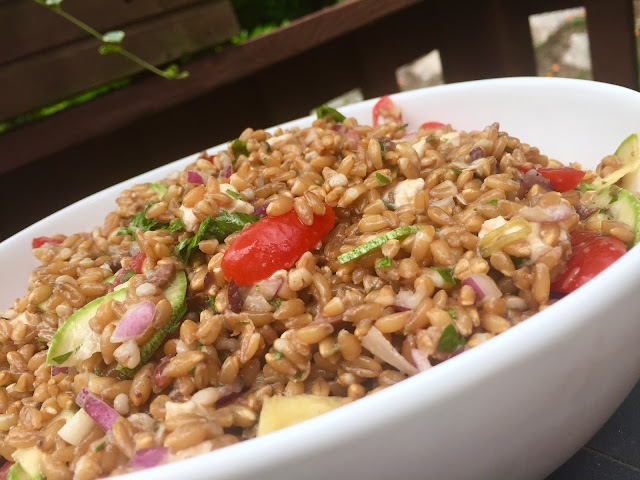 Did you notice that instead of depending on the dressing to brighten the earthy crunch of farro, the grain is delicately encased in it's own thick, caramelized broth, thanks to cooking along side fresh parsley, garlic and onion in stock-like fashion? Easygoing yet intriguing, the definition of a winning crowd-pleaser. This salad screams "summer picnic" all over it, and it delivers exceptionally. 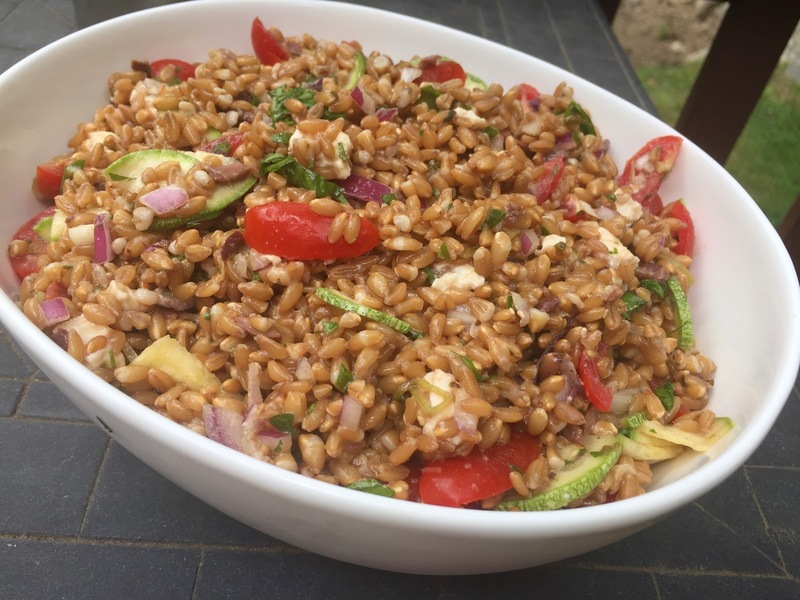 How familiar are you with farro? Let's switch gears to talk about this wholesome grain. 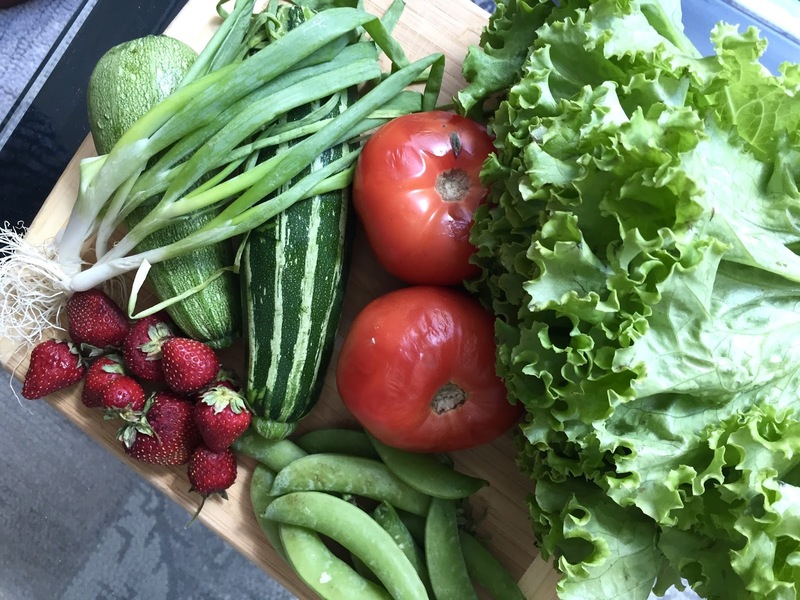 As I recently learned from the Greenmarket Regional Grains Project, a Grow NYC-backed endeavor to encourage consumers to buy locally milled and grown grains & legumes, farro is not a single entity. Rather, it is the blanket term for a family of three grains: farro piccolo (einkorn), farro medio (emmer) and farro grande (spelt). Emmer, the kind most often found in the US, is available in two forms: whole, with a hardened texture similar to popcorn kernels, and softer pearled, resembling the look of barley. Whole farro takes longer to cook—you're looking at 60-75 minutes of simmering unless soaked in advance overnight. Pearled farro has had some of it's bran removed (the seed's outer skin) and thus cooks closer to 15-20 minutes. Does it matter which variety you buy? Not really. Losing some bran in the pearled variety does eliminate a bit of fiber, but the good stuff— "the disease-preventing, metabolism-boosting, blood-sugar-stabilizing, cholesterol-lowering antioxidants, fibers, vitamins, minerals, essential fatty acids, and the like", according to Serious Eats Guide to Whole Grains—is found in the germ, which maintains intact for both varietals. Given that this recipe is a Northeast locavore's dream—tomatoes, red onion, zucchini, parsley and basil are all in season at the farmers markets—why not go local for your grains, too? "The new frontier in local food," says the Regional Grains Project. 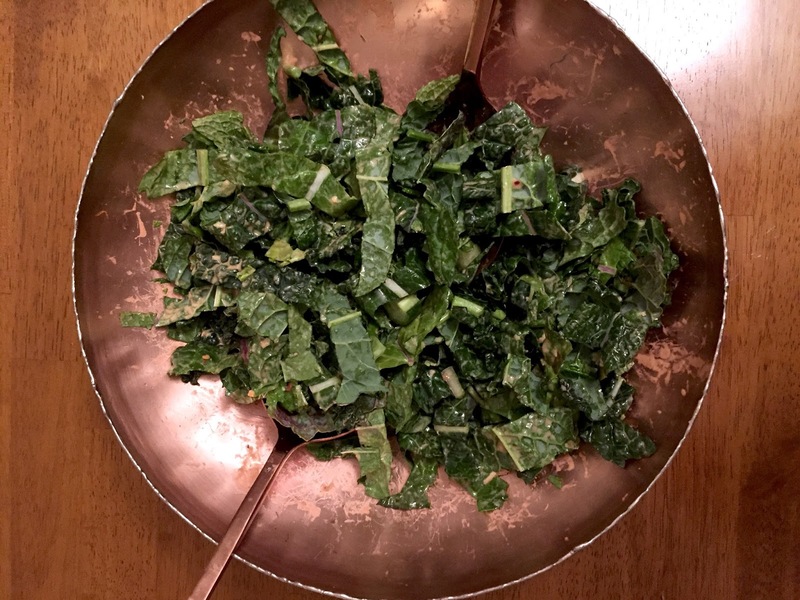 In a season where vegetable-speckled, oil and vinegar based salads reign supreme, the timing sure is right. 1. Add the farro, one onion half, garlic, handful of parsley and salt along with 2 3/4 cups water to a 2 quart pot. Bring to a boil, then cover, reduce to a simmer, and cook for 10 minutes*. Turn off burner and let sit, covered, for 5 more minutes. Discard the onion, garlic and large pieces of parsley. Spread out on a rimmed sheet pan and let cool completely (do not skip this step or the mozzarella will melt into the finished dish). 2. Whisk together the olive oil, vinegars and honey to prepare the dressing. Chop the remaining onion half finely. 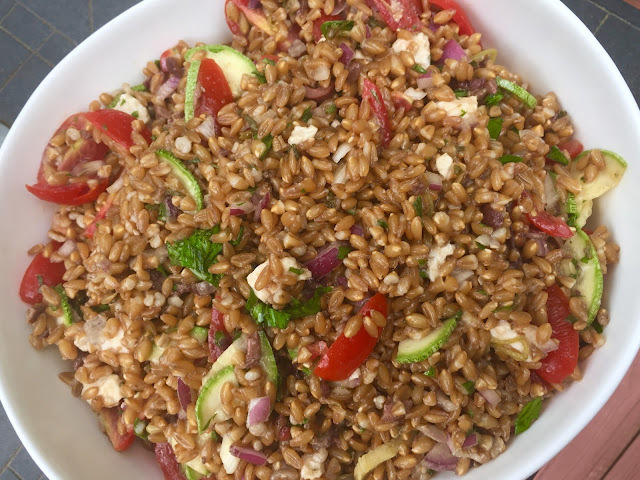 Add onion, cooled farro, mozzarella, kalamata olives, tomatoes, zucchini, remaining tablespoon of parsley and basil to a deep bowl. Pour the dressing over the ingredients and stir well to combine, using a long wooden spoon or rubber spatula. Season with salt and pepper. 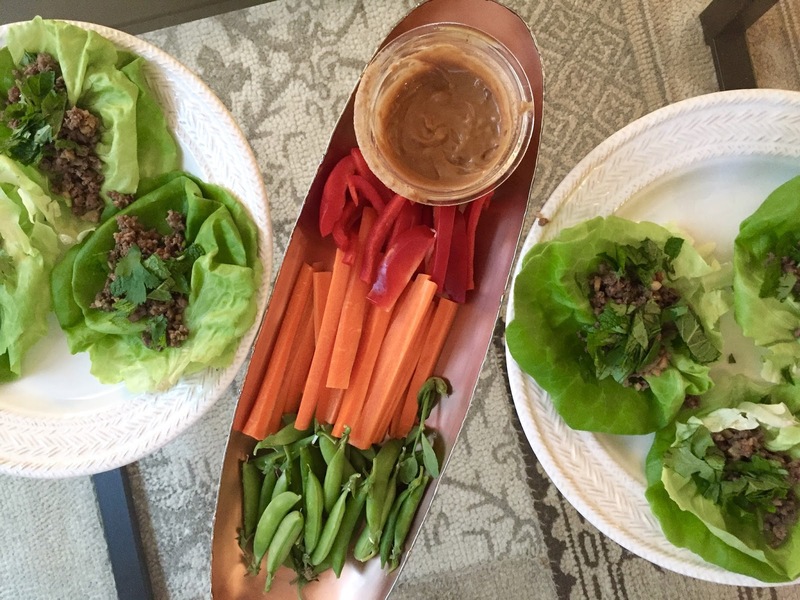 The salad is ready to serve, but can also be made and stored in the fridge, covered, one day ahead. *This is the cooking time for pearled farro. 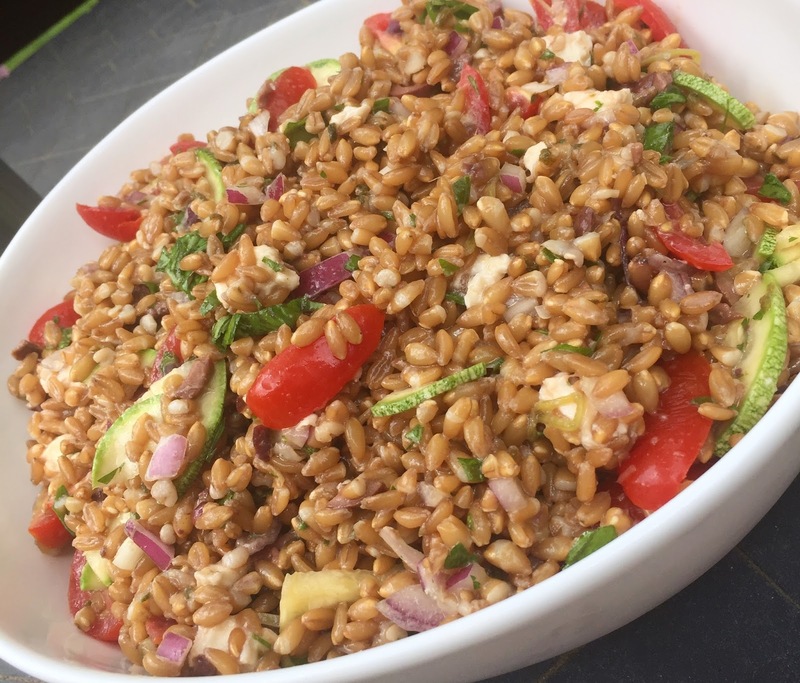 Whole farro will take anywhere from 40 to 75 minutes to cook. Monitor and taste frequently to determine when the grain is ready—it should be easy to bite yet slightly firm, like al dente pasta.